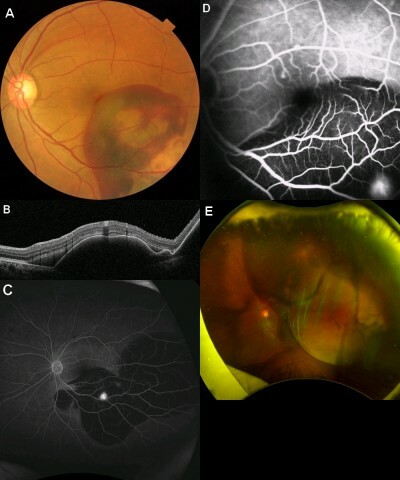 Abstract: We experienced a case of sympathetic ophthalmia in a fellow eye after vitrectomy for subretinal hemorrhage related to polypoidal choroidal vasculopathy. A 60-year-old male consulted us for polypoidal choroidal vasculopathy with subretinal hemorrhage in his left eye. The recurrence of massive subretinal hemorrhage refractory to repeated pars plana vitrectomies leads to phthisis bulbi. Two months later, multiple serous retinal detachments were observed in his right eye. Positive human leukocyte antigen-DR4 and the uveitis were helpful in distinguishing between sympathetic ophthalmia and age-related macular degeneration. High-dose pulse intravenous steroid contributed to recovery of visual acuity after resolution of serous retinal detachment.